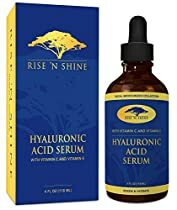 WHY SHOULD YOU USE HYALURONIC ACID ON YOUR SKIN?Hyaluronic acid is clinically tested product and proven to be a great for healing sun damaged, rough, dehydrated and flaky skin, due to the fact that it is a powerful moisture-binding ingredient, which retains the moisture from the environment and the skin. It forms a moisture protected barrier on the skin. It is undoubtedly safe to use. Don’t let the “acid” fool you, it should not harm your skin or cause rashes. Hyaluronic acid is a naturally occurring substance in the body, which decreases with age. Applied topically it will give your skin that young and fresh appearance.It works on all skin types, even oily and break-out prone skin. Hyaluronic acid is an ingredient which absolutely works across the board. WHAT ARE SOME OTHER MAIN BENEFITS YOU GET FROM USING HYALURONIC ACID? – Reduction of dark circles and plumping of the skin reducing fine lines, wrinkles and puffiness. – It evens out your skin tone and texture – Its water retaining properties make it a great moisturizer – Deeply nourishes and activates the collagen production of the skin. – This product features all-natural and 72% organic ingredients. – This product has been enriched with Vitamin C for extra nourishment to your skin and helps diminish blemishes such as sun spots, age spots and discoloration. Because of Its unique properties it is known to reverse the effects of free radical damage as well as possibly providing protection from UV damage. All of which are factors in reversing the signs of aging. Backed by a 30 Day No Hassle, Money Back Guarantee! Click the Add to Cart button now to bring back that healthy younger looking skin!